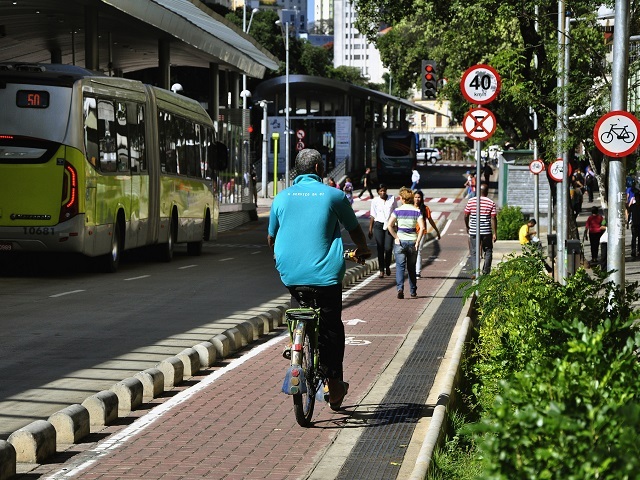 Cities across Brazil are sharing best practices and improving public transport in recognition of citizens’ demand for sustainable mobility. Photo by Mariana Gil/EMBARQ Brasil. Conducted by the Brazilian National Association of Transport Operators (NTU), this year’s Seminar on Urban Public Transportation responded to a growing demand among Brazilian citizens for improved public transport. 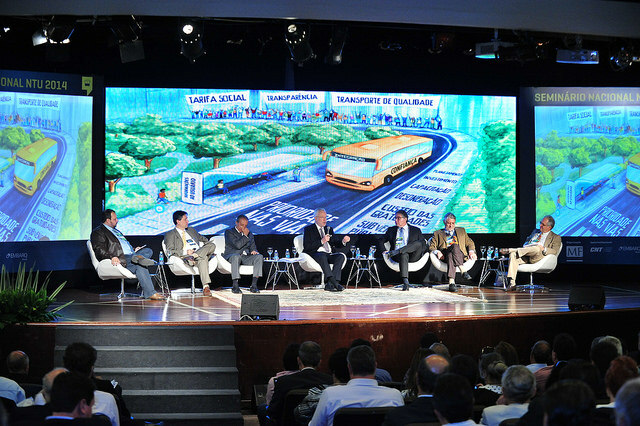 On August 27 and 28, 2014, city planners, experts, transport operators, and civil society – including President and Director of EMBARQ Brasil Luis Antonio Lindau – met to review and discuss all aspects of this topic that is becoming increasingly relevant to Brazilian cities. The goal of the seminar is to analyze and propose solutions to transform public transport across Brazil. 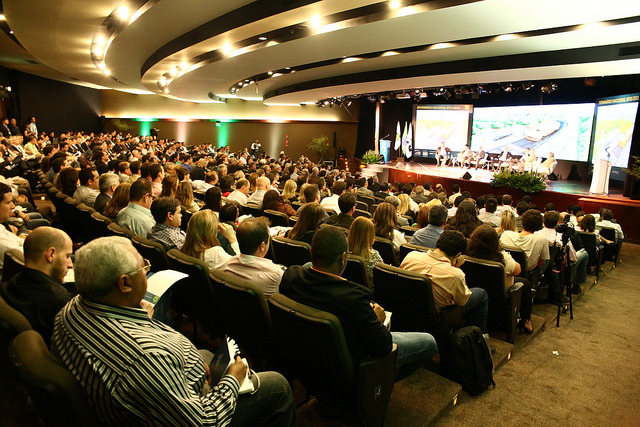 Authorities, operators and experts discuss Brazilian public transport in the 2014 edition of the Brazilian National Association of Transport Operators (NTU) Seminar on Urban Public Transportation. Luis Antonio Lindau, Director of EMBARQ Brazil, was a part of the panel discussing bus-rapid transit (BRT). Photo by NTU/Flickr. The pressure on Brazilian governments to improve public transport came to a head last July when a wave of protests swept the country. The question of how to effectively meet the needs of residents, however, still has no conclusive answer. To analyze the best strategies and solutions, the inaugural NTU panel brought together specialists from different areas. In discussing a range of challenges and potential solutions, participants all shared the view that improving public transport needs to be an urgent priority. They discussed issues such as federal investment in public transport and the creation of integrated transport networks, busways and bus rapid transit (BRT) systems. The panel also analyzed strategies to make public transport more affordable for citizens, such as tax breaks for public transport operators, which allows for lower fares, and even free forms of public transport. Journalist Alexandre Garcia mediated the panel, which consisted of NTU President Octavius Cunha, Executive Secretary of the National Front of Mayors (FNP) Gilberto Perre, President and Director of the National Forum of Secretaries of Transportation Renato Gianolla, Junior Director of the National Confederation of Neighborhood Associations (Conam) Getúlio Vargas, representative from the National Movement for The Right to Quality Public Transport (MDT) Nazarene Affonso, and transport expert Frederico Bussinger. The NTU seminar, hosted in Brasilia, garnered significant attention as cities across the country face a critical moment in improving public transport. Photo by NTU/Flickr. The second panel of the day was titled “Quality and Safety in BRT systems,” and featured EMBARQ Brasil’s Luis Antonio Lindau. “It’s the first time in Brazil that we are addressing BRT at an event without needing translators,” joked Lindau, in reference to the fact that Brazilian cities, more so than any other country in the world, already have high quality BRT systems. “The BRT systems of Belo Horizonte and Rio de Janeiro are models for other cities, and luckily others also are already gradually deploying their systems using best practices,” he added. Joining Lindau on the panel were Ramon Victor César of Belo Horizonte’s BHTrans, Conrado Grava de Souza of the São Paulo Metro, Lélis Marcos Teixeira of the Rio de Janeiro bus system, and Clarisse Cunha Linke of Institute for Transportation and Development Policy (ITDP Brasil). They discussed strategies to ensure maximum efficiency, quality, and safety of BRT systems. Lindau also explained that both transport users and pedestrians benefit from road safety interventions. In fact, road safety audits, which consist of risk mapping and technical recommendations to improve a project or system in operation, have the potential to reduce the chance of accidents by 40%. 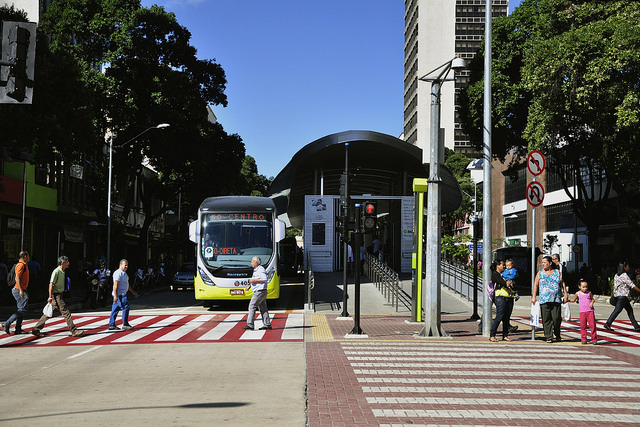 EMBARQ Brazil conducted a series of technical assistance projects for BRT MOVE in Belo Horizonte, including road safety audits as part of EMBARQ Brasil’s QualiÔnibus (Quality Bus Service) Program. Photo by Mariana Gil/EMBARQ Brazil. A mass transit system such as BRT requires technical precautions to operate efficiently and deliver a high quality service to the community. In the panel on BRT safety and quality, Lindau presented the three initiatives of the QualiÔnibus (Quality Bus Service) program, developed by EMBARQ Brasil with support from FedEx. “We have developed a satisfaction survey to measure user perception before and after the implementation of a BRT system. [QualiÔnibus] aims to create a standard questionnaire template that is adaptable to the context of different cities; understand users’ needs and practices and share solutions with other cities; and encourage the creation of high quality management systems in cities,” said Lindau. This project is also being implemented in Belo Horizonte, Curitiba and Rio de Janeiro. Another initiative within QualiÔnibus, called “Day 1 of Operation,” helps BRT operations run smoothly from the start. As Lindau described, “There are a few years between the time the decision is made to implement BRT and its inauguration. The first day of operation is strategic to show the system is strong and reliable.” Lindau also said that operators have the chance to learn from other cities that have already launched their systems. An important factor in the security of BRT systems is the driver. A third initiative within the QualiÔnibus program, called “Safety First,” trains drivers in personal and professional development and monitoring programs. “The goal is to stimulate attention for road safety within companies that operate urban transport to reduce the number of incidents involving city buses,” Lindau said. The seminar continued its programming on Thursday, August 28 with a series of panels. One panel, called “Anti-Corruption Law and Policy Compliance,” included a case study of Fetranspor (Federation of Passenger Transport of the State of Rio de Janeiro), and workshops on intelligent transportation systems, “electronic ticketing and technologies for control of tipping” and “operational management and user information.” Learn more about the seminar on the NTU website (Portuguese) or on the seminar event page (English).